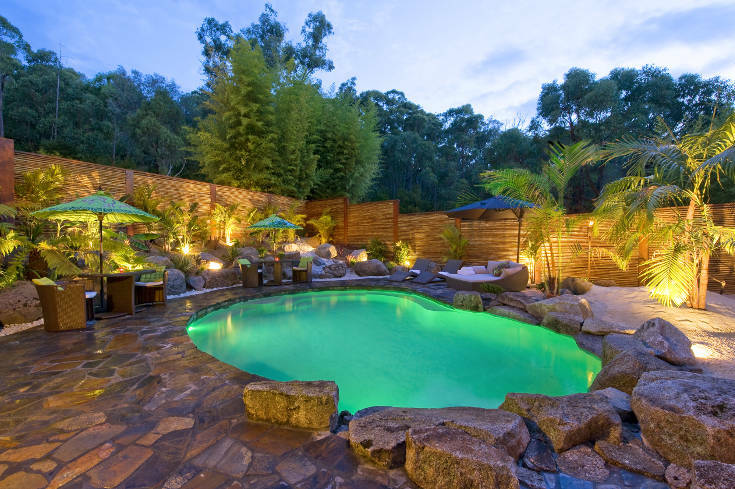 The closest mineral springs from Melbourne (only 45 Minutes). 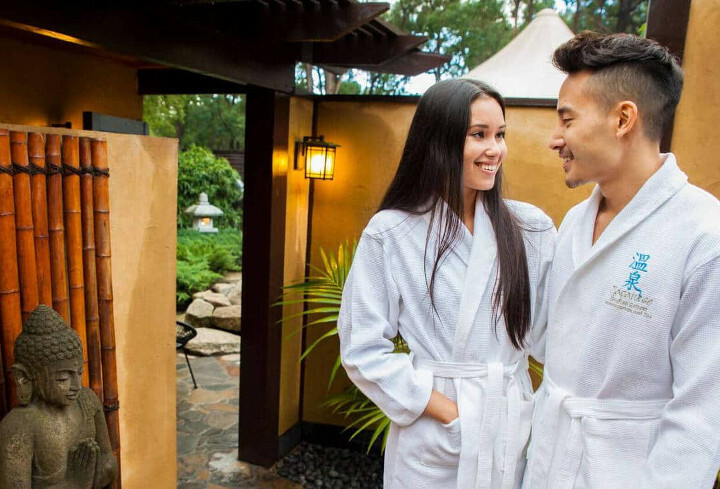 The only mineral springs in Victoria that offer completely private outdoor bathing and romantic couples bathing. Bathe (with or without clothes) in complete privacy in a Japanese walled garden or tropical pool setting for 50 or 80 minutes. 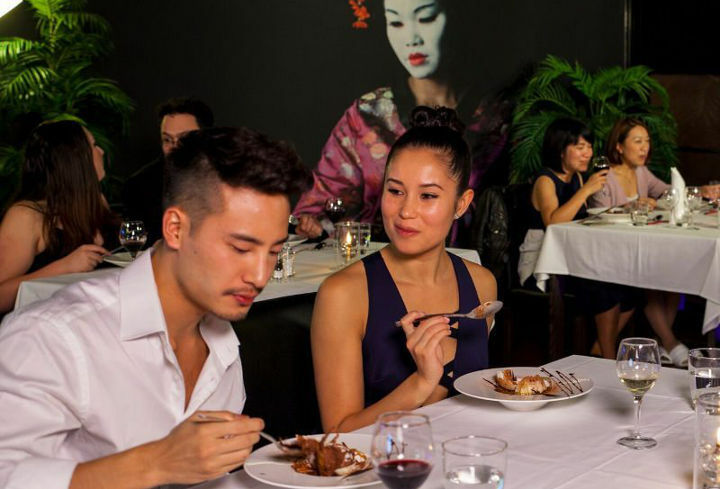 For a romantic couples day spa experience, add massage or dining for a luxury getaway in Victoria. The Water: Our Melbourne hot mineral spring water has filtered into the Dandenong Ranges aquifer over a period of many years. This water absorbs minerals from rocks and mineral deposits. Water is drawn from an underground spring on the property and is pumped to the surface from a depth of approximately 80 metres. Complete Privacy: Your totally private bathing space is within a walled Japanese or tropical garden. You cannot be seen by anyone else. Swimwear is optional when bathing outdoors. 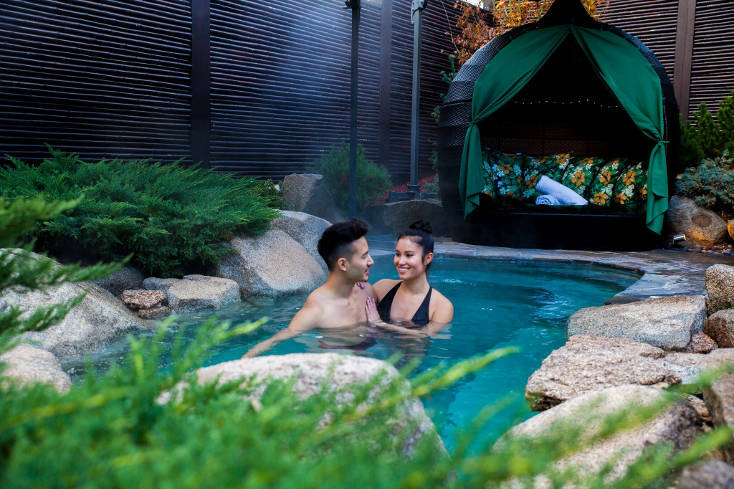 Our Melbourne hot mineral springs are the only spa resort in Victoria offering this level of privacy. Mineral water heated to a comfortable bathing temperature between 37-40 degrees. Sodium 230 – Salt soaks have been known to relieve symptoms of arthritis. Chloride 620 – Musculoskeletal benefits. Calcium 210 – Vital for the growth and maintenance of bones. Magnesium 34 – Maintains normal heart rhythms; converts blood sugar to energy; maintains muscle tissue and hormone levels. Sulphate 24 – Rids the body of toxins; promotes the health of bone, hair, nails, fluids in joints, vertebral discs; Sulphur is an anti-inflammatory. Potassium 3.6 – Assists in the normalisation of heart rhythms; reducing high blood pressure; eliminating body toxins and promotes healthy skin. Iron 3.4 – Builds up the quality of blood; increases resistance to stress and disease. Prevents fatigue and promotes good skin tone. Soaking in mineral waters should not be done at excessively high temperatures without medical clearance when any contraindicated condition exists. A tepid to warm bath (35° C – 37° C) is as safe as taking a bath at home. Bathing is not advised if you have any of the conditions listed below. Please see your medical practitioner if in doubt. As we are a small resort with limited mineral spring and day spa facilities we do not accept cancellations to bookings. If an emergency arises and you are unable to attend your booking please contact us as soon as possible and we will do our best to reschedule your booking. Confirmation of an appointment is acknowledgement of this cancellation policy.